North Korea has a new tablet computer and it’s a hit with students, according to a report from the state-run KCNA news agency on Wednesday. The new gadget is the latest in a string of tablet PCs reported by KCNA as being developed, manufactured and available in the DPRK, although the device is almost certainly imported from overseas. 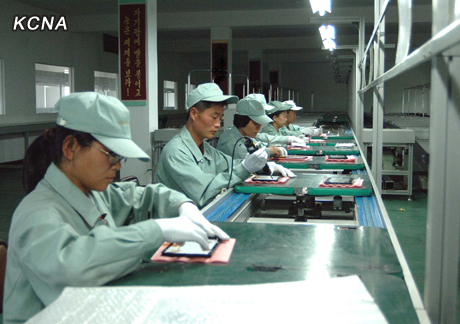 Pictures accompanying the report don’t show any manufacturing, just workers in overalls checking devices — a style that’s been seen several times in the past couple of years, including once in 2011 when North Korean TV news featured a laptop TV factory that apparently produced several models of computer. On closer inspection the laptops appear to be models produced by a major Chinese electronics maker and imported into North Korea. 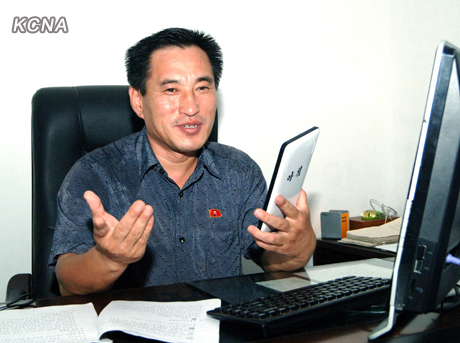 In the latest report, KCNA said the tablet is called “Achim” (morning) and provides “teaching materials, references, dictionaries and scientific data.” The report was accompanied by some pictures, including one of a smiling man holding the device. And then there were the factory photos. Look closely, there’s no evidence of any manufacturing on the production line. And with the exception of the worker with an electrical tool in his hand, none of the others appear to have any tools. 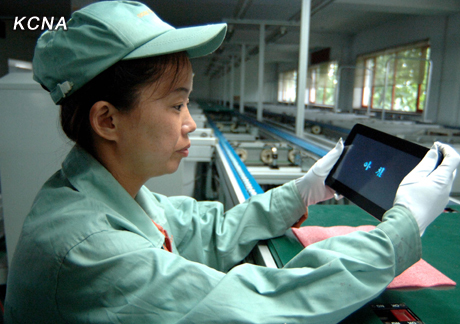 The most generous interpretation of the image is that these workers are checking the functions of the tablet. The lack of any photos of an electronics production line, especially when North Korea seems keen to show photos of other factories and work, and previous experience raises suspicions this computer is probably manufactured in China and imported to North Korea for domestic use. In January this year, KCNA published pictures of workers checking or testing laptop computers but in that story too something wasn’t quite right about the production line. Several models of tablet PC were shown in a TV news bulletin early this year. They were on sale at the Pyongyang International Trade Fair and were reportedly made by the “New Information Technology Trade Company” of the Pyongyang-based Korea Computer Center. The first tablet-like computer, really a personal digital assistant (PDA), appeared in Pyongyang in 2010. 2 Comments on "North Korea shows off another tablet PC"
Does anyone else notice that factory is empty? Other then the 5 workers, there is not much going on in the background of those pics. No “production line”. 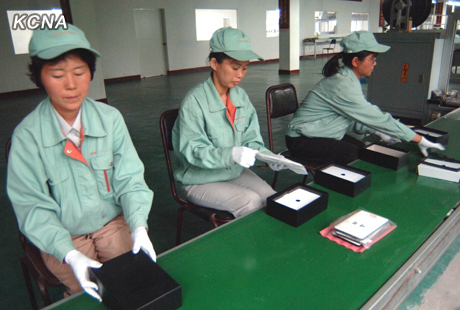 Just an image of a few people assembling a product that probably came fully assembled from China. You are not fooling us, North Korea.